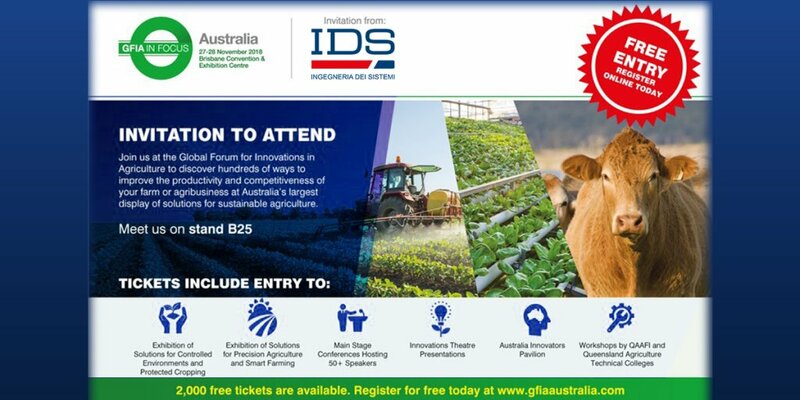 IDS is pleased to participate at GFIA In Focus – Australia 2018, the foremost exposition in agricultural innovation, in Australasia, will be held in Brisbane from 27th to 28th of November. Farmers are under constant pressure to increase performance and efficiency to ensure sustainability. This created a drive for technology implementation on farms. Come and Join our Australian team, at Booth B25, to discover hundreds of ways to improve the productivity and competitiveness of your farm of agribusiness. There are numerous challenges for the farmer in implementing and integrating these technologies to suit their workplace. Relevant technologies like Internet of Things – IoT, Cloud Based Storage/Processing, drones and Machine Learning are all emerging technologies available to the future farmer. The Global Forum for Innovations in Agriculture – GFIA In Focus is Australia’s largest agricultural innovation event, playing host to technologies such as computer and mobile-based apps, GPS mapping and other new technologies to help farmers collect data, manage risk, increase yields, save time and cut costs.